With parents too busy to pay her attention, an older brother and sister who would rather spend their time with friends, and peers who oscillate between picking on her and simply ignoring her, it's no wonder that Fain spends most of her time in a world of her own making. During the day, Fain takes solace in crafting her own fantastical adventures in writing, but in the darkness of night, these adventures come to life as Fain lives and breathes alongside a legion of imaginary creatures. Whether floating through space or under the sea, climbing mountains or traipsing through forests, Fain becomes queen beyond--and in spite of--the walls of her bedroom. In time, Fain begins to see possibilities and friendships emerge in her day-to-day reality . . . yet when she is let down by the one relationship she thought she could trust, Fain must decide: remain queen of the imaginary creatures, or risk the pain that comes with opening herself up to the fragile connections that exist only in the real world? 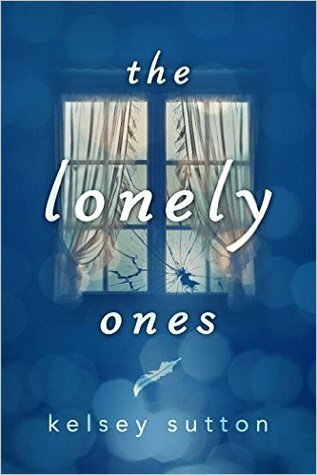 Told in breathless and visual verse, THE LONELY ONES takes readers through the intricate inner workings of a girl who struggles to navigate isolation and finds friendship where she least expects it. I have never read a book quite like The Lonely Ones. It’s told in lyrical free verse and is absolutely brilliant! I literally read it in one sitting. I just couldn’t put it down. The story just flowed and instantly captured my heart. The Lonely Ones is about a girl named Fain. Her family is going through a hard time, and pretty much ignore her. Her dad recently lost his job and is having a hard time finding work. Her mom is always working and is rarely home. It’s actually really sad. I don’t want to say much about the story because I feel like you just have to go in blind to be able to enjoy it better. What I will say is that it’s beautifully written and amazed on how much it touched me. Kelsey is a genius and so talented. It’s a story about life and growing up. I wish I could write more, but I really don't want to give anything away. I promise that you will thank me and fall in love too! Great review, Ana!!! Thanks so much for joining the Lonely Ones review tour!!! I second this, thank you! So wonderful.